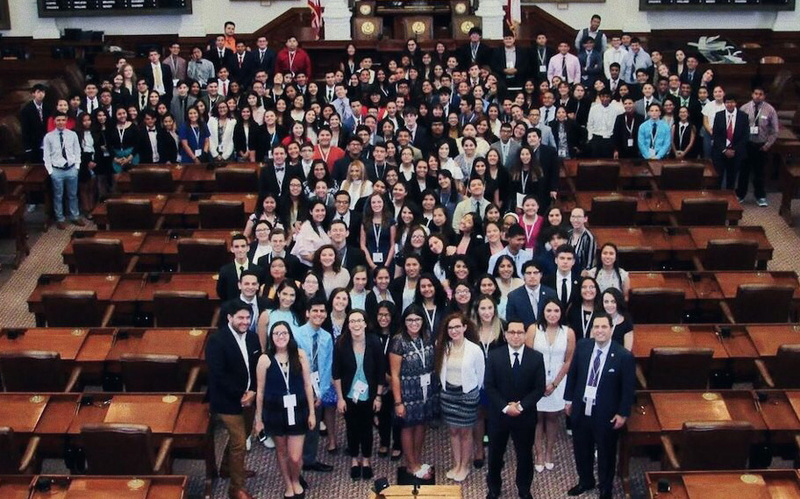 More than 200 students — most of them from Texas — converged on Austin for the 2017 edition of the Texas LDZ (Lorenzo de Zavala Youth Legislative Session) last week. Four students garnered enough support for their bills to see them passed. Kenia Escobar (Saint Joseph Academy, Brownsville, Texas) wrote a resolution to create learning centers to promote education of immigrants in the U.S.
Emily MacCormack (Communications Arts High School, San Antonio, Texas) proposed the creation of a program to promote art and leadership. Leticia De Leon (Austin High School, Austin, Texas) wrote a proposal calling for increasing high school graduation rates through a program that teaches life skills and economics skills. Salvador Garcia (Escuela Carlos Pereyra, Torreon, Mexico) authored a proposal for creating murals in public parks to promote culture within communities; it was passed and then argued at Final Trial, established as constitutional by the Supreme Court Justices. As usual, the husband-and-wife team of George Rodriguez and Michelle Saenz-Rodriguez led the program as education directors, but two major differences held true this year. First, the program took place while George was preparing his campaign for Congress in Texas’s 32nd Congressional District. Second, their son George Nicolas, an NHI alumnus currently at Loyola University in New Orleans, served as Secretary of State for the program. George Nicolas and his sister Bella were also one of four sibling pairs involved in staging the event; Loren and Alison Elkins, Valdemar and Vincent Martinez, and Kaleigh and Connor Krauss helped staff Texas LDZ, while Jorge Trevino helped staff a group of participants including his sister Yael. Keeban Villarreal (Travis Early College High School, San Antonio, Texas) was elected Governor, Cuauhtémoc Arizpe (Burbank High School, San Antonio, Texas) was elected Lieutenant Governor, Claudia Klinck (Bishop Ireton High School, Alexandria, Virginia) was elected, and Isaak Salinas (Falfurrias High School, Falfurrias, Texas) was elected Chief Supreme Court Justice. Though the Texas Legislature held a special session, keeping the NHIers from using the Texas State Capitol as they usually do, Rep. Diego Bernal arranged for students to make a pilgrimage to the House Chambers, and Rep. Larry Gonzalez — an alumni of the 1985 Texas LDZ program — spoke to the group during the week. Also of note: 60 percent of the participants at this year’s Texas LDZ were female.